Tagboard an innovative software that allows businesses to collect multiple social media contents and categorize them using hashtags. It is a superb solution for end users, agencies, brands, and marketers. The software comes with great features which include keyword filters, tagboard live tool, and superior Eventbrite, Hootsuite, and Google Chrome extensions. It allows users to transform content from the major social media platforms into comprehensive and impactful displays that can be embedded, redisplayed, and reposted on various media. Tagboard offers one of the best in-arena social media experience. It helps you to run social media campaigns in an engaging visual format that supercharge your audience participation. Also, the solution allows you to sift through social media posts and promote crucial content or block offensive content. 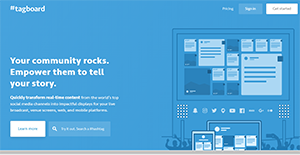 Tagboard is a robust platform built with great features. It’s designed to allow for social media content viewing on big screens as well as mobile devices. The software comes with a Tagboard Live tool that features flexible customization tools and beautiful displays. It provides an intuitive control panel that helps you to adjust the screen resolution, size, positioning, speed, view distance and even animation style. The Tagboard live tool powers you to extend your reach to engage more audience with highly integrated social displays. It helps you to streamline all workflows for the live events. The simple, highly responsive, and intuitive interface helps you to monitor high volume content easily. The keywords filter helps you to monitor social media post and block offensive sites. It gives you the freedom to sift through the post, spot crucial content and promote it effectively. The tool is designed to be completely user-friendly making it simple to pinpoint and feature all your favorite social media. Tagboard provides a single streamlined, embedded view. It helps you to display hashtags and posts from all the social media networks. Once you close the viral loop, you set manual or automatic replies with Instagram or Twitter. The software also allows for team administration. It gives you the freedom to share control of the Tagboard with your team members in a bid to simplify your workflow. Also, it puts you in control of all the messaging via Twitter or Instagram accounts. Besides, it makes it easier to customize replies to each author featured on your Tagboard. If you are interested in Tagboard it might also be sensible to check out other subcategories of Best Reputation Management Software listed in our database of B2B software reviews. It is important to keep in mind that virtually no service in the Reputation Management Software category is going to be a perfect solution that can match all the needs of different business types, sizes and industries. It may be a good idea to read a few Tagboard reviews first as some solutions may perform well exclusively in a very small set of applications or be prepared with a really specific industry in mind. Others might work with a goal of being simple and intuitive and therefore lack complex elements desired by more experienced users. You can also find apps that support a wide group of customers and offer a rich feature set, however this in most cases comes at a higher price of such a service. Be certain that you're aware of your requirements so that you purchase a software that offers all the functionalities you search for. How Much Does Tagboard Cost? We realize that when you make a decision to buy Reputation Management Software it’s important not only to see how experts evaluate it in their reviews, but also to find out if the real people and companies that buy it are actually satisfied with the product. That’s why we’ve created our behavior-based Customer Satisfaction Algorithm™ that gathers customer reviews, comments and Tagboard reviews across a wide range of social media sites. The data is then presented in an easy to digest form showing how many people had positive and negative experience with Tagboard. With that information at hand you should be equipped to make an informed buying decision that you won’t regret. What are Tagboard pricing details? What integrations are available for Tagboard?